Josh Eichorn: can be used as a floatation device in the event of a water landing. Ten years ago. Alison Summers stumbles across the secret lair of Sgt. Marvel who is revealed to be her grandfather, wealthy businessman Bill August. She explains that she had starting exploring the mansion when her alcoholic father started raiding the liquor cabinet while her mother was flirting with the butler. Alison accidentally uncovered a hidden passageway hidden behind a grandfather clock and investigated, discovering that her grandfather is a world-famous superhero. Sgt. Marvel reveals that neither of his daughters knows about his dual identities. Alison had assumed that he had trained her aunt to become the hero Dart but she never knew that her father also moonlighted as a fellow superhero. Alison convinces Sgt. Marvel to train her to become an expert hand-to-hand combatant. During one of their training sessions, Alison learns about the God Sword, a blade that can literally cut through any known material. Over the next several months, Alison’s father grows suspicious about her constantly receiving bruises after spending time with Bill August. He speaks with his wife and together they agree to ban Alison from seeing her grandfather any further. This conversation is overhead by Alison who murders her parents in secret. She then dons the Dart costume and desires to continue that legacy, a plan ruined when her aunt returned. This led to Alison eventually manipulating events that led to Mako killing the original Dart, allowing her to assume the mantle. 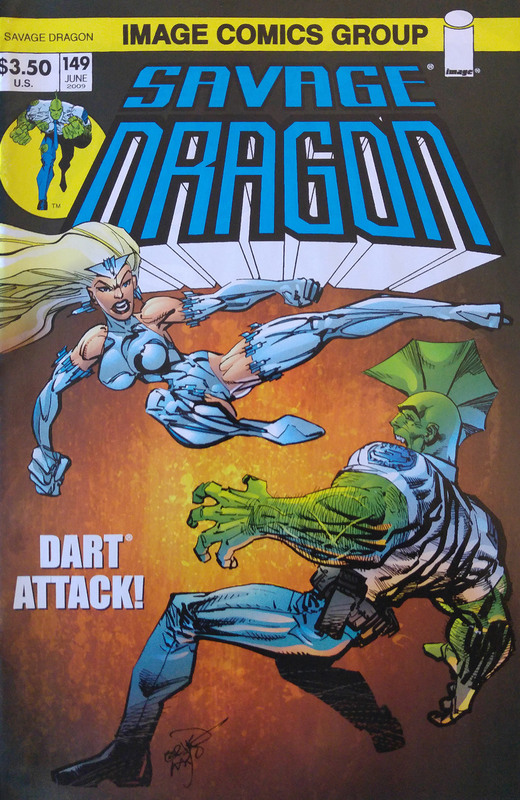 Some time later, the new Dart accompanies many heroes on a raid on the Vicious Circle’s Gaylord Manor and in the resulting confusion; she shot dead Sgt. Marvel before pledging her future to the criminal organization. In the present, Dragon meets Captain Jack Stewart who is the new man in charge of his precinct. They talk about the fates of Jack’s predecessors but he is undeterred by their deaths. Dragon then goes to retrieve his children from an interrogation room where they are answering questions about their abduction. Dragon takes the youngsters away to school where they run into Daredevil, out on patrol in the city. He mentions that he and the Little Wise Guys are renting an apartment nearby and that they are slowly getting used to life in the 21st century. Dragon accompanies Jerry Zout over to the August Mansion to search for clues regarding the current whereabouts of Dart. This turns up no new leads and they head back towards the precinct where Jerry asks whether Dragon has told his kids about the incident with Virus. He has kept the fact that he “died” and was resurrected in the body of his killer as he is unsure how to broach the subject. Jerry is suddenly killed mid-sentence as the God Sword is thrust through his head from outside their patrol car. The police car crashes as Dart makes her move, attempting to finish off Dragon but he is not seriously injured from the impact. He dismisses Dart as a threat but her exploding projectiles leave him bleeding, prompting to take the fight more seriously. 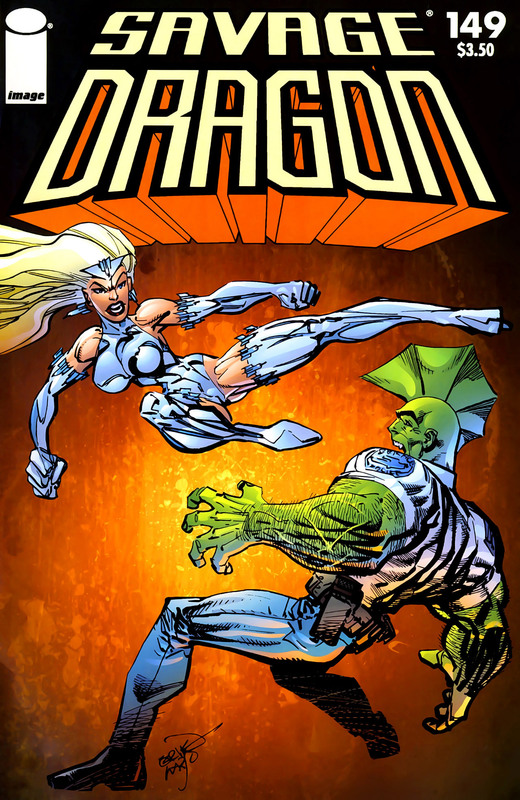 Dart is able to slice through anything thrown at her using her weapon and even cuts off one of Dragon’s arms before he knocks down an abandoned building on top of her. Dart avoids serious death by leaping down an exposed sewer drain but her God Sword is left behind and retrieved by Dragon. Eight years ago. The United States Military has been deployed against the alien tower that has appeared in Pyrite Gorge over the past couple of days. A fleet of helicopter gunships approach the tower and the lead aircraft opens fire with missiles. The soldiers watch on as their weapons do not connect, instead returning to the helicopter that fired them. The remaining helicopters watch on helplessly as their comrades are blown clear out of the sky by their own missiles. They then come under attack but no weapon seems to have been fired from the tower. The nature of their attack soon comes to light as the Ethereal Warrior known as Ethrian flies through the air, using his alien strength to rip the helicopters to pieces.